Asheville is a city in and the county seat of Buncombe County, North Carolina, United States. It is the largest city in Western North Carolina, and the 11th largest city in North Carolina. The city's population was 87,236 according to the 2013 estimates. It is the principal city in the four-county Asheville metropolitan area, with a population of 424,858 in 2010. Asheville is home to the United States National Climatic Data Center (NCDC), the world's largest active archive of weather data. Before the arrival of the Europeans, the land where Asheville now exists lay within the boundaries of the Cherokee Nation. In 1540, Spanish explorer Hernando de Soto came to the area, bringing the first European visitors along with European diseases, which seriously depleted the native population. The area was used as an open hunting ground until the middle of the 19th century. The history of Asheville, as a town, began in 1784. In that year, Colonel Samuel Davidson and his family settled in the Swannanoa Valley, redeeming a soldier's land grant from the state of North Carolina. Soon after building a log cabin at the bank of Christian Creek, Davidson was lured into the woods by a band of Cherokee hunters and killed. Davidson's wife, child and female slave fled on foot overnight to Davidson's Fort (named after Davidson's father General John Davidson) 16 miles away. In response to the killing, Davidson's twin brother Major William Davidson and brother-in-law Colonel Daniel Smith formed an expedition to retrieve Samuel Davidson's body and avenge his murder. Months after the expedition, Major Davidson and other members of his extended family returned to the area and settled at the mouth of Bee Tree Creek. The United States Census of 1790 counted 1,000 residents of the area, excluding the Cherokee Native Americans. Buncombe County was officially formed in 1792. The county seat, named "Morristown" in 1793, was established on a plateau where two old Indian trails crossed. In 1797, Morristown was incorporated and renamed "Asheville" after North Carolina Governor Samuel Ashe. Asheville, with a population of approximately 2,500 by 1861, remained relatively untouched by the Civil War, but contributed a number of companies to the Confederate States Army, and a substantially smaller number of soldiers to the Union. For a time, an Enfield rifle manufacturing facility was located in the town. The war came to Asheville as an afterthought, when the "Battle of Asheville" was fought in early April 1865 at the present-day site of the University of North Carolina at Asheville, with Union forces withdrawing to Tennessee after encountering resistance from a small group of Confederate senior and junior reserves and recuperating Confederate soldiers in prepared trench lines across the Buncombe Turnpike; orders had been given to the Union force to take Asheville only if this could be accomplished without significant losses. An engagement was also fought later that month at Swannanoa Gap as part of the larger Stoneman's Raid, with Union forces retreating in the face of resistance from Brig. Gen. Martin, commander of Confederate troops in western North Carolina, but returning to the area via Howard's Gap and Henderson County. In late April 1865 troops under the overall command of Union Gen. Stoneman captured Asheville. Hartley, Stoneman's Raid, p. 362 (Blair, 2010) After a negotiated departure, the troops nevertheless subsequently returned and plundered and burned a number of Confederate supporters' homes in Asheville. The years following the war were a time of economic and social hardship in Buncombe County, as throughout most of the defeated South. On October 2, 1880, the Western North Carolina Railroad completed its line from Salisbury to Asheville, the first rail line to reach the city. Almost immediately it was sold and resold to the Richmond and Danville Railroad Company, becoming part of the Southern Railway in 1894. With the completion of the first railway, Asheville experienced a slow but steady growth as industrial plants increased in number and size, and new residents built homes. Textile mills were established and plants were set up for the manufacture of wood and mica products, foodstuffs, and other commodities. Asheville had the first electric street railway lines in the state of North Carolina, the first of which opened in 1889. These would be replaced by buses in 1934. In 1900, Asheville was the third largest city in the state, behind Wilmington and Charlotte. 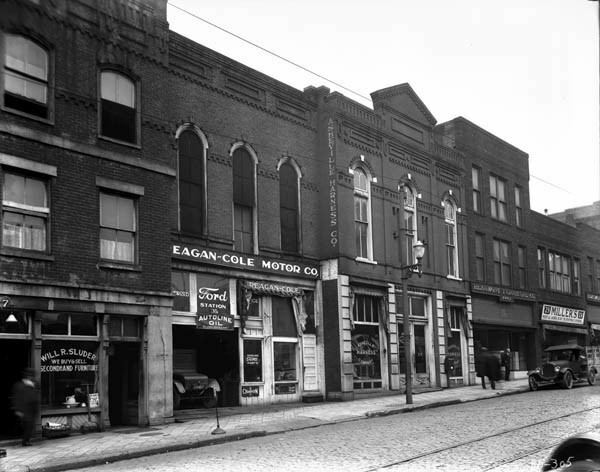 Asheville prospered in the decades of the 1910s and 1920s. During these years, Rutherford P. Hayes, son of President Rutherford B. Hayes, bought land, helped to create the African-American Burton Street Community, and worked to establish a sanitary district in West Asheville, which became an incorporated town in 1913, merging with Asheville in 1917. The Great Depression, the period of Asheville's history made world-famous by the novel Look Homeward, Angel, hit Asheville quite hard. On November 20, 1930, eight local banks failed. Only Wachovia remained open with infusions of cash from Winston-Salem. Because of the explosive growth of the previous decades, the per capita debt owed by the city (through municipal bonds) was the highest in the nation. By 1929, both the city and Buncombe County had incurred over $56 million in bonded debt to pay for a wide range of municipal and infrastructure improvements, including City Hall, the water system, Beaucatcher Tunnel, and Asheville High School. Rather than default, the city paid those debts over a period of fifty years. From the start of the depression through the 1980s, economic growth in Asheville was slow. 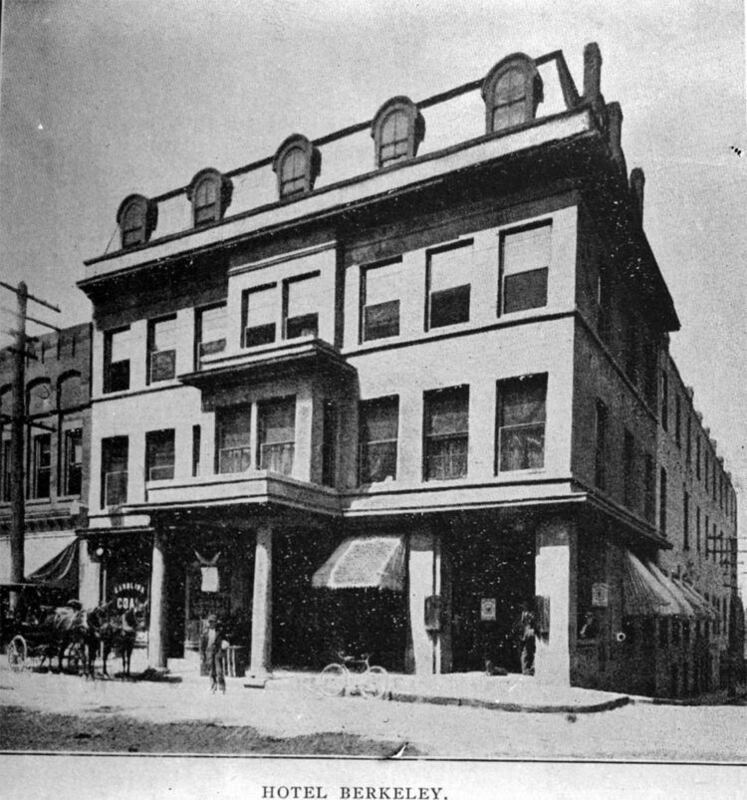 During this time of financial stagnation, most of the buildings in the downtown district remained unaltered. Therefore, Asheville has one of the most impressive, comprehensive collections of Art Deco architecture in the United States. On July 15–16, 1916, the Asheville area was subject to severe flooding from the remnants of a tropical storm which caused more than $3 million in damage. In September 2004, remnants of Hurricanes Frances and Ivan caused major flooding in Asheville, particularly at Biltmore Village. In 2003, Centennial Olympic Park bomber Eric Robert Rudolph was transported to Asheville from Murphy, North Carolina, for arraignment in federal court. One of "20 Great Cities For Writers" (Flavorwire, 2013). Asheville has been listed as one of the "Top 25 Small Cities for Art" in AmericanStyle magazine's annual list from 2000 to 2012 and has reigned the champion "Beer City USA" each year from 2009 to 2012. Dozens of micro breweries dot the downtown and major producers, including New Belgium Brewing Company (opening 2015) are in the process of building in or near the city. In his 2008 book, The Geography of Bliss, author Eric Weiner cited Asheville as one of the happiest places in the United States. 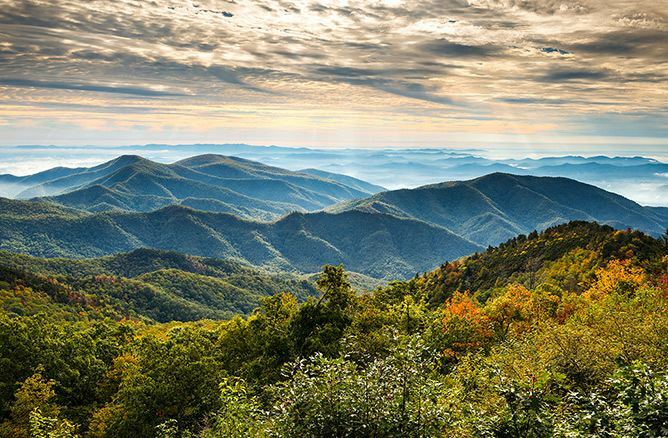 Asheville and the surrounding mountains are also popular in the autumn when fall foliage peaks in October. The scenic Blue Ridge Parkway runs through the area and near the Biltmore Estate. Asheville is located in the Blue Ridge Mountains at the confluence of the Swannanoa River and the French Broad River. According to the United States Census Bureau, the city has a total area of 45.3 square miles (117.2 km2), of which 44.9 square miles (116.4 km2) is land and 0.31 square miles (0.8 km2), or 0.66%, is water. Asheville has a humid subtropical climate (Köppen Cfa), resembling the rest of the Piedmont region of the southeastern U.S., but with noticeably cooler temperatures due to the higher altitude; it is part of USDA Hardiness zone 7a. The area's summers in particular, though warm, are not as hot as summers in cities farther east in the state, as the July daily average temperature is 73.8 °F (23.2 °C) and there is an average of only 9.4 days with 90 °F (32 °C)+ highs annually; the last time a calendar year has passed without 90 °F readings is 2009. Moreover, warm nights where the low remains at or above 70 °F (21 °C) are much more uncommon than 90 °F temperatures. Winters are cool, with a January daily average of 37.1 °F (2.8 °C) and highs remaining at or below freezing on 5.5 days. Official record temperatures range from −16 °F (−27 °C) on January 21, 1985 to 100 °F (38 °C) on August 21, 1983; the record cold daily maximum is 4 °F (−16 °C) on February 4, 1895, while, conversely, the record warm daily minimum is 77 °F (25 °C) on July 17, 1887. Readings as low as 0 °F (−18 °C) or as high as 95 °F (35 °C) rarely occur, the last occurrences being January 7, 2014 and July 1, 2012, respectively. The average window for freezing temperatures is October 17 to April 18, allowing a growing season of 181 days. Precipitation is relatively well spread (though the summer months are slightly wetter), and averages 45.6 inches (1,160 mm) annually, but has historically ranged from 22.79 in (579 mm) in 1925 to 75.22 in (1,911 mm) in 2013. Snowfall is sporadic, averaging 9.9 inches (25.1 cm) per winter, but actual seasonal accumulation varies considerably from one winter to the next; accumulation has ranged from trace amounts in 2011–12 to 48.2 inches (122.4 cm) in 1968–69. Freezing rain often occurs, accompanied by more significant disruption. North – includes the neighborhoods of Albemarle Park, Beaverdam, Beaver Lake, Chestnut Hills, Colonial Heights, Five Points, Grove Park, Hillcrest, Kimberly, Klondyke, Montford, and Norwood Park. Chestnut Hill, Grove Park, Montford, and Norwood Park neighborhoods are listed in the National Register of Historic Places. Montford and Albemarle Park have been named local historic districts by the Asheville City Council. East – includes the neighborhoods of Kenilworth, Beverly Hills, Chunn's Cove, Haw Creek, Oakley, Oteen, Reynolds, Riceville, and Town Mountain. West – includes the neighborhoods of Camelot, Wilshire Park, Bear Creek, Deaverview Park, Emma, Hi-Alta Park, Lucerne Park, Malvern Hills, Sulphur Springs, Burton Street, Haywood Road, and Pisgah View. South – includes the neighborhoods of Ballantree, Biltmore Village, Biltmore Park, Oak Forest, Royal Pines, Shiloh, and Skyland. Biltmore Village has been named a local historic district by the Asheville City Council. Notable architecture in Asheville includes its Art Deco city hall, and other unique buildings in the downtown area, such as the Battery Park Hotel, the original of which was 475-feet long with numerous dormers and chimneys; the Neo-Gothic Jackson Building, the first skyscraper on Pack Square; Grove Arcade, one of America's first indoor shopping malls; and the Basilica of St. Lawrence. The S&W Cafeteria Building is also a fine example of Art Deco architecture in Asheville. The Grove Park Inn is an important example of architecture and design of the Arts and Crafts movement. Asheville's recovery from the Depression was slow and arduous. Because of the financial stagnation, there was little new construction and much of the downtown district remained unaltered. This however has allowed Asheville to be a great collection of Art Deco and truly a style all its own. The Montford Area Historic District and other central areas are considered historic districts and include Victorian houses. On the other hand, Biltmore Village, located at the entrance to the famous estate, showcases unique architectural features that are found only in the Asheville area. It was here that workers stayed during the construction of George Vanderbilt's estate. Today, however, as with many of Asheville's historical districts, it has been transformed into a district home to quaint, trendy shops and interesting boutiques. The YMI Cultural Center, founded in 1892 by George Vanderbilt in the heart of downtown, is one of the nation's oldest African-American cultural centers. Asheville is the larger principal city of the Asheville-Brevard CSA, a Combined Statistical Area that includes the Asheville metropolitan area (Buncombe, Haywood, Henderson, and Madison counties) and the Brevard micropolitan area (Transylvania County), which had a combined population of 398,505 at the 2000 census. At the 2000 census, there were 68,889 people, 30,690 households and 16,726 families residing in the city. The population density was 1,683.4 per square mile (650.0/km²). There were 33,567 housing units at an average density of 820.3 per square mile (316.7/km²). The racial composition of the city was: 77.95% White, 17.61% Black or African American, 3.76% Hispanic or Latino American, 0.92% Asian American, 0.35% Native American, 0.06% Native Hawaiian or Other Pacific Islander, 1.53% some other race, and 1.58% two or more races. There were 30,690 households of which 22.2% had children under the age of 18 living with them, 38.1% were married couples living together, 13.0% had a female householder with no husband present, and 45.5% were non-families. 36.8% of all households were made up of individuals and 13.8% had someone living alone who was 65 years of age or older. The average household size was 2.14 and the average family size was 2.81. Age distribution was 19.6% under the age of 18, 10.3% from 18 to 24, 28.7% from 25 to 44, 23.1% from 45 to 64, and 18.3% who were 65 years of age or older. The median age was 39 years. For every 100 females, there were 87.8 males. For every 100 females age 18 and over, there were 84.9 males. The median household income was $32,772, and the median family income was $44,029. Males had a median income of $30,463 versus $23,488 for females. The per capita income for the city was $20,024. About 13% of families and 19% of the population were below the poverty line, including 24.9% of those under age 18 and 10.1% of those age 65 or over. Asheville is the headquarters of the Episcopal Diocese of Western North Carolina, which is seated at the Cathedral of All Souls. Asheville is also an important city for North Carolinian Catholics, who make pilgrimages to the Basilica of St. Lawrence. Asheville is the largest city located within the Asheville MSA (Metropolitan Statistical Area). The MSA includes Buncombe County; Haywood County; Henderson County; and Madison County; with a combined population – as of the 2014 Census Bureau population estimate – of 442,316. Apart from Asheville, the MSA includes Hendersonville and Waynesville, along with a number of smaller incorporated towns: Biltmore Forest, Black Mountain, Canton, Clyde, Flat Rock, Fletcher, Hot Springs, Laurel Park, Maggie Valley, Mars Hill, Marshall, Mills River, Montreat, Weaverville and Woodfin. Several sizable unincorporated rural and suburban communities are also located nearby: Arden, Barnardsville (incorporated until 1970), Bent Creek, Candler, Enka, Fairview, Jupiter (incorporated until 1970), Leicester, Oteen, Skyland, and Swannanoa. The City of Asheville operates under a council-manager form of government, via its charter. The city council appoints a city manager, a city attorney, and a city clerk. In the absence or disability of the mayor, the vice-mayor performs the mayoral duties. The vice-mayor is appointed by the members of City Council. City Council determines the needs to be addressed and the degree of service to be provided by the administrative branch of city government. In 2005 Mayor Charles Worley signed the U.S. Conference of Mayors Climate Protection Agreement and in 2006 the City Council created the Sustainable Advisory Committee on Energy and the Environment. In 2007 the Council became the first city on the East Coast to commit to building all municipal buildings to LEED Gold Standards and to achieve 80 percent energy reduction of 2001 standards by 2040. Also in 2007 the Council signed an agreement with Warren Wilson College stating the intent of the city and college to work together toward climate partnership goals. In 2009, a group of Asheville citizens challenged the legitimacy of Cecil Bothwell's election to the City Council, citing the North Carolina Constitution, which does not permit atheists to hold public office. Bothwell has described himself as a "post theist" rather than an atheist and is a member of a local Unitarian Universalist congregation. The opponents to his election never filed suit. In response to the charge, legal scholars explained that the U.S. Supreme Court held in Torcaso v. Watkins that religious tests for political office are unconstitutional. Mr. Bothwell served his four-year Council term and was re-elected in 2013. While the city council elections are non-partisan, party politics may enter into play with both Republican and Democratic counterparts backing their registered members candidacy. An effort by the council to return to partisan elections was defeated by voters in a referendum held in November 2007. In the North Carolina Senate, Terry Van Duyn (D-Asheville) and Chuck Edwards (R-Hendersonville) both represent parts of Buncombe County. Van Duyn represents most of the city of Asheville. Edwards represents a small portion of the southern part of Asheville. In the North Carolina House of Representatives, Susan Fisher (D-Asheville), John Ager (D-Asheville), and Brian Turner (D-Asheville) all represent parts of the county. All three of them represent parts of the city, although the majority of it is in Fisher's district. In the 2012 presidential election, Barack Obama won the entirety of Buncombe County with 55% of the vote. Obama has visited the city on a few occasions. In April 2010, he and his family vacationed in the city; it was the first time he visited since October 5, 2008. In the United States presidential election of 2016, Hillary Clinton won 54.30% of the vote in Buncombe County and Donald Trump 40.10%, according to the North Carolina State Board of Elections. North Carolina is represented in the United States Senate by Richard Burr (R-Winston-Salem) and Thom Tillis (R-Greensboro). The city of Asheville is based in both North Carolina's 10th congressional district and North Carolina's 11th congressional district, represented by Patrick McHenry (R-Gaston County) and Mark Meadows (R-Jackson County), respectively. Students (K-12) are assigned to one of two public school systems in the city of Asheville, Buncombe County Schools or Asheville City Schools, based on address. Public Asheville City Schools include Asheville High School (known as Lee H Edwards High School 1935–1969), School of Inquiry and Life Sciences at Asheville, Asheville Middle School, Claxton Elementary, Randolph Learning Center, Hall Fletcher Elementary, Isaac Dickson Elementary, Ira B. Jones Elementary and Vance Elementary. Asheville High has been ranked by Newsweek magazine as one of the top 100 high schools in the United States. The Buncombe County Schools System operates high schools, middle schools and elementary schools both inside and outside the city of Asheville. Clyde A. Erwin High School, T C Roberson High School and A. C. Reynolds High School are three Buncombe County schools located in Asheville. Asheville was formerly home to one of the few Sudbury schools in the Southeast, Katuah Sudbury School. It is also home to several charter schools, including Francine Delany New School for Children (one of the first charter schools in North Carolina), ArtSpace Charter School, and Evergreen Community Charter School, an Outward Bound-Expeditionary Learning School, recognized as one of the most environmentally conscious schools in the country. Two private residential high schools are located in the Asheville area: the all-male Christ School (located in Arden) and the co-educational Asheville School. Other private schools include Carolina Day School, Veritas Christian Academy and Asheville Christian Academy. Shaw University College of Adult and Professional Education or C.A.P.E. Asheville is served by Asheville Regional Airport in nearby Fletcher, North Carolina, and by Interstate 40, Interstate 240, and Interstate 26. A milestone was achieved in 2003 when Interstate 26 was extended from Mars Hill (north of Asheville) to Johnson City, Tennessee, completing a 20-year half-billion dollar construction project through the Blue Ridge Mountains. Work continues to improve Interstate 26 from Mars Hill to Interstate 40 by improving U.S. Route 19 and U.S. Route 23 and the western part of Interstate 240. This construction will include a multimillion-dollar bridge to cross the French Broad River. The city operates Asheville Redefines Transit, which consists of sixteen bus lines providing service throughout the City of Asheville and to Black Mountain, North Carolina. The Norfolk Southern Railway passes through the city, though passenger service is currently not available in the area. The residents of Asheville are served by the Buncombe County Public Libraries, consisting of 11 branches located throughout the county with the headquarters and central library, Pack Memorial Library, being located downtown. The system also includes a law library in the Buncombe County Courthouse and a genealogy and local history department located in the central library. Drinking water in Asheville is provided by the Asheville water department. The water system consists of three water treatment plants, more than 1,600 miles (2,600 km) of water lines, 30 pumping stations and 27 storage reservoirs. Sewer services are provided by the Metropolitan Sewerage District of Buncombe County, power provided by Duke Energy, and natural gas is provided by PSNC Energy. Asheville offers public transit through the ART (Asheville Redefines Transit) bus service that operates across the City of Asheville and to the town of Black Mountain. Routes originate from a central station located at 49 Coxe Avenue. The city of Asheville is home to a Duke Energy Progress coal power plant near Lake Julian. This power plant is designated as having Coal Combustion Residue Surface Impoundments with a High Hazard Potential by the EPA. In 2012 a Duke University study found high levels of arsenic and other toxins in North Carolina lakes and rivers downstream from the Asheville power plants coal ash ponds. Samples collected from coal ash waste flowing from the ponds at the Duke Energy Progress plant to the French Broad River in Buncombe County contained arsenic levels more than four times higher than the EPA drinking water standard, and levels of selenium 17 times higher than the agency's standard for aquatic life. In March 2013 the State of North Carolina sued Duke Energy Progress in order to address similar environmental compliance issues. In July 2013 Duke Energy Corp. and North Carolina environmental regulators proposed a settlement in the lawsuit that stated coal ash threatened Asheville's water supply. The settlement called for Duke to assess the sources and extent of contamination at the Riverbend power plant in Asheville. Duke would be fined $99,100 if the settlement is approved. Following the coal ash spill in Eden, NC resulting in 82,000 tons of coal ash leaking into the Dan River, the North Carolina DENR cancelled all previous settlements with Duke Energy. Duke said a stormwater drainage pipe under the utility's Dan River Steam Station lagoon ruptured Feb 2, allowing ash slurry to pour into the river. Duke Energy faces future legislation by Tom Apodaca, republican NCGA Senate leader forcing them to clean up their south Asheville coal ash ponds. Tom Apodaca expects the legislation will be filed as soon as the General Assembly returns to session in May 2014. Apodaca expects the ponds will be cleaned up in 5–10 years under his law. The city of Asheville claims a clear focus on sustainability and the development of a green economy. For Asheville, this goal is defined in their Sustainability Management Plan as: "Making decisions that balance the values of environmental stewardship, social responsibility and economic vitality to meet our present needs without compromising the ability of future generations to meet their needs." As part of the Zero Waste AVL initiative, which began in 2012, each resident receives "Big Blue," a rolling cart in which they can put all of their materials unsorted. Residents can recycle a great variety of materials and "in this first year of the program 6.30% of waste was diverted from the landfill for recycling." The Asheville City Council's goal is to reduce the overall carbon footprint 80% by the year 2030. This means 4% or more reduction per year. In 2009 the reduction was made when the "City installed over 3,000 LED street lights, managed its water system under ISO 14001 standards for environmental management, improved the infrastructure and management of many of its buildings, and switched many employees to a 4-day work week (which saves emissions from commuting)." Asheville is recognized by the Green Restaurant Association as the first city in the U.S. to be a Green Dining Destination (significant density of green restaurants). Live music is a significant element in the tourism-based economy of Asheville and the surrounding area. Seasonal festivals and numerous nightclubs and performance venues offer opportunities for visitors and locals to attend a wide variety of live entertainment events. Asheville has a strong tradition of street performance and outdoor music, including festivals, such as Bele Chere and the Lexington Avenue Arts & Fun Festival (LAAFF). One event is "Shindig on the Green," which happens Saturday nights during July and August on City/County Plaza. By tradition, the Shindig starts "along about sundown" and features local bluegrass bands and dance teams on stage, and informal jam sessions under the trees surrounding the County Courthouse. The "Mountain Dance & Folk Festival" started in 1928 by Bascom Lamar Lunsford is said to be the first event ever labeled a "Folk Festival". Another popular outdoor music event is "Downtown After 5," a monthly concert series held from 5 pm till 9 pm that hosts popular touring musicians as well as local acts. A regular drum circle, organized by residents in Pritchard Park, is open to all and has been a popular local activity every Friday evening. It is also home of the Moog Music Headquarters. Asheville also plays host to the Warren Haynes Christmas Jam, an annual charity event which raises money for Habitat For Humanity, and attracts nationally touring acts; in addition to regular performers Haynes himself, and the band he plays with, Gov't Mule, past acts include The Allman Brothers Band, Dave Matthews Band, Ani Difranco, Widespread Panic. Other big acts that have played the Asheville area in recent years are bands such as Dawes, Porcupine Tree, Broken Social Scene, Ween, the Avett Brothers, Gillian Welch, Cat Power, Ghost Mice, Loretta Lynn, the Disco Biscuits, STS9, Pretty Lights, Primus, M. Ward and the Mountain Goats. DJ music, as well as a small, but active, dance community are also components of the downtown musical landscape. The town is also home to the Asheville Symphony Orchestra and the Asheville Lyric Opera and there are a number of bluegrass, country, and traditional mountain musicians in the Asheville area. A residency at local music establishment the Orange Peel by the Smashing Pumpkins in 2007, along with the Beastie Boys in 2009, brought national attention to Asheville. The Seattle based rock band Band of Horses have also recorded their last two albums at Echo Mountain Studios in Asheville, as have the Avett Brothers (who have also traditionally played a New Year's Eve concert in Asheville). Christian vocal group the Kingsmen originated in Asheville. Area colleges and universities, such as the University of North Carolina at Asheville, compete in sports. UNCA's sports teams are known as the Bulldogs and play in the Big South Conference. The Fighting Owls of Warren Wilson College participate in mountain biking and ultimate sports teams. The college is also home of the Hooter Dome, where the Owls play their home basketball games. The Civic Center is home to the Blue Ridge Rollergirls, an up-and-coming team in the sport of Women's Flat-Track Roller Derby. Asheville is a major hub of whitewater recreation, particularly whitewater kayaking, in the eastern US. Many kayak manufacturers have their bases of operation in the Asheville area. Some of the most distinguished whitewater kayakers live in or around Asheville. In its July/August 2006 journal, the group American Whitewater named Asheville one of the top five US whitewater cities. Asheville is also home to numerous Disc Golf courses. Soccer is another popular recreational sport in Asheville. There are two youth soccer clubs in Asheville, Asheville Shield Football Club and HFC. The Asheville Hockey League provides opportunities for youth and adult inline hockey at an outdoor rink at Carrier Park. The rink is open to the public and pick-up hockey is also available. The Asheville Civic Center has held recreational ice hockey leagues in the past. Because hundreds of miles of trails are in close proximity to Asheville, trail running is also a popular local sport. The Asheville Community Theatre was founded in 1946, producing the first amateur production of the Appalachian drama, Dark of the Moon. Soon after, the young actors Charlton Heston and wife Lydia Clarke would take over the small theatre. The current ACT building has two performance spaces – the Mainstage Auditorium, which seats 399 patrons (and named the Heston Auditorium for its most famous alumni); and the more intimate black box performance space 35below, seating no more than 49 patrons. The North Carolina Stage Company is the only resident professional theatre in the downtown area. The Asheville Lyric Opera celebrated its 10th anniversary in 2009 with a concert featuring Angela Brown, David Malis, and Tonio Di Paolo, veterans of the Metropolitan Opera. The ALO has typically performed three fully staged professional operas for the community in addition to its vibrant educational program. Asheville Vaudeville, Asheville's only monthly vaudeville variety show, performs new material each month from local magicians, jugglers, comedians, musicians, stilt-walkers, knife-throwers and more. Asheville has been home to many small, experimental theatre companies over the years, such as Consider the Following..., Betterdays Productions, Black Swan Theatre, Dark Horse Theatre and Pleiades Productions. The Asheville capoeira performance movement was solidified with the arrival of world-renowned Mestre Pe de Chumbo to the area in 2006. The capoeira group continues to give performances in the streets, on the stage and during festivals. Due to this group's cumulative efforts in the art of capoeira and in developing community the Asheville Culture Project (ACP) was established in 2010. The ACP is a community arts initiative that offers a space for the integration of cultural performing arts, community and social justice. The cultural center offers the community performances, classes and outreach. Different Strokes! Performing Arts Collective, founded in 2010, produces and presents theatre that confronts issues of social diversity. Anam Cara Theatre Company, which opened its doors in West Asheville in February 2011, produces eclectic, avant garde theatre aimed at building community, sparking dialogue, and promoting progressive social change. In February 2013, Anam Cara ended its popular Naked Girls Reading series in protest of policies imposed by Naked Girls Reading's national headquarters that the theatre found "sexist and limiting." Anam Cara has also produced several works of devised theatre. Alternative performance thrives with events like the Fringe Festival and Americana Burlesque and Sideshow Festival. Several burlesque and boylesque troupes have had success in town, including Blue Skies Burlesque, Bombs Away Cabaret, Bootstraps Burlesque, The Rebelles, Seduction Sideshow. and The Girly Girl Revue. Deb au Nare's Burlesque Academy of Asheville was founded in January 2015 and provides classes on burlesque entertainment. Asheville is the home to Terpsicorps Theatre of Dance and The Asheville Ballet. The Flood Fine Arts Center is a non-profit contemporary art institution in the River Arts District. Places of worship in Asheville include the Roman Catholic Basilica of St. Lawrence, the Episcopal Cathedral of All Souls and St. Luke's Church, Jesus People Church of Asheville, Conservative Jewish Beth Israel Synagogue, and The Asheville Jewish Learning Institute. Although the area has had a long history with the entertainment industry, recent developments are cementing Asheville as a potential growth area for both film and TV. The Asheville Film Festival has completed its sixth year. However the City of Asheville, which funds the festival, has announced that it will no longer fund the festival. The festival's future is in doubt. The city is also an annual participant in the 48-Hour Film Project. The city's Public-access television cable TV station URTV broadcast programs from 2006 to 2011. Films made at least partially in the area include A Breed Apart, Searching for Angela Shelton, Last of the Mohicans (box office #1 film in the U.S.), Being There, My Fellow Americans, Loggerheads, The Fugitive (#1 film), All the Real Girls, Richie Rich, Thunder Road, Hannibal (#1 film), Songcatcher, Patch Adams (#1 film), Nell, Forrest Gump (#1 film), Mr. Destiny, Dirty Dancing, Bull Durham, The Private Eyes, The Swan, The Clearing, The Conquest of Canaan, House of Poets, The Purple Box, 28 Days, and The Hunger Games (box office #1 film). Locally produced films include Golden Throats of the 20th century and Anywhere, U.S.A., a winning film at the 2008 Sundance Film Festival for Special Jury Prize for Spirit of Independence. Asheville also hosts the ActionFest Film Festival 2010–2012. The 2010 inaugural edition included Chuck Norris, who was honored as the first ActionFest "man of action." The Twin Rivers Media Festival is an independent multi-media film festival held annually in downtown Asheville. The festival held its 20th annual event in May 2013. Asheville is in the "Greenville-Spartanburg-Asheville-Anderson" television DMA and the "Asheville" radio ADI for the city's radio stations. The primary television station in Asheville is ABC affiliate WLOS-TV Channel 13, with studios in Biltmore Park and a transmitter on Mount Pisgah. Other stations licensed to Asheville include WUNF, a PBS station on Channel 33 and The CW affiliate WYCW on Channel 62. Asheville is also served by the Upstate South Carolina stations of WYFF Channel 4 (NBC), WSPA-TV Channel 7 (CBS), WHNS-TV Channel 21 (FOX), MyNetworkTV station WMYA Channel 40 and 3ABN station Channel 41. SCETV PBS affiliates from the Upstate of South Carolina are generally not carried on cable systems in the North Carolina portion of the DMA, though are accessible via an HD antennae in some areas. The Asheville Citizen-Times is Asheville's daily newspaper which covers most of Western North Carolina. The Mountain Xpress is the largest weekly in the area, covering arts and politics in the region. The Asheville Daily Planet is a monthly paper. The Biltmore Beacon is a weekly newspaper specifically written to be of interest to residents and businesses in the various Biltmore communities including Biltmore Forest, Biltmore Park, Biltmore Lake, The Ramble at Biltmore Forest, Main Street at Biltmore Park and Biltmore Village. WCQS is Asheville's public radio station. It has National Public Radio news and other programs, classical and jazz music. Friends of Community Radio created WSFM-LP, a volunteer-based, grassroots community radio station. The station is licensed under the "Free Form" format. There are also a variety of broadcasts dedicated to Poetry, Interviews, Selected Topics, Children's Radio, and Comedy. The staff have remote broadcast many local concerts including (but not limited to) Monotonix from Israel, JEFF the Brotherhood from Nashville, Screaming Females from New Jersey, and local acts. The character Harrison Shepherd, the narrator and protagonist of Barbara Kingsolver's novel The Lacuna lived in Asheville. Asheville is featured as a location in the novel One Second After by William R. Forstchen (who lives in the area). Asheville is the place Natalie, the heroine in the novel Joshua Spassky by Gwendoline Riley, visits to meet the eponymous hero. She is an admirer of F. Scott Fitzgerald and fascinated by Zelda Fitzgerald who died in a fire at the Highland hospital in Asheville. Deborah Smith's novel The Crossroads Cafe is set in the mountains above Asheville, and prominent scenes take place in the city. Sequels to that novel also take place in and around Asheville. Angela Blake, a character in the TV series The West Wing was from Asheville. The film The Hunger Games was filmed near Asheville. Thomas Wolfe's novel Look Homeward, Angel is largely set in Asheville—named Altamont in the book. James Dashner's novel The Kill Order takes place in and around Asheville. Callum Hunt, the protagonist of Holly Black and Cassandra Clare's The Magisterium Series, is from Asheville. Several prominent scenes take place in the city.